Would you like to receive the latest news in your mailbox? You can register here for news and updates per email. The renewal of the NS 1300 engine series is still in progress. The first results look very promising. With pictures of the real 1300 engines next to renders of the digital model, every part of the engine is checked, so that as much realism as possible can be achieved. Starting with the latest edition of the 1300 engine when it was still in active service with the Dutch Railways, which was the yellow version with the large NS logo on the sides of the engine, every version of the 1300 engine class will be renewed. After the release of Dutch Classics 11, development of the second version of the NS 1300 engine class has started.The engines have entered the virtual engine shed and are taken apart completely for the upgrade process. More information about the upgrade of the NS 1300 engine class will follow later. This is the week of the release of Dutch Classics Mat'46 ELD4. I am proud to tell you that finally Mat'46 ELD4 (Dutch Classics 11) is available in the shop from today. 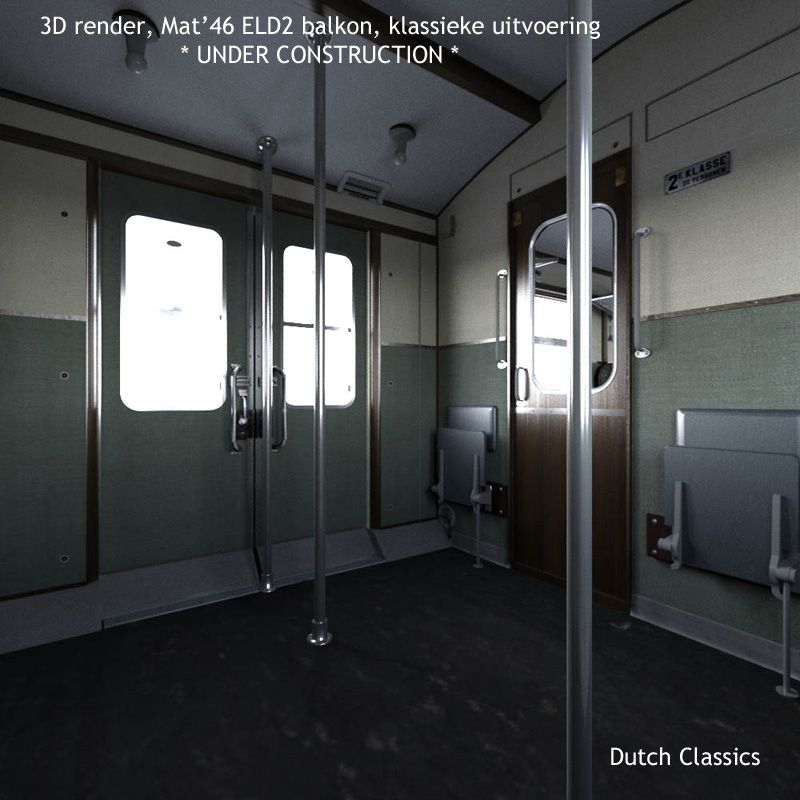 Dutch Classics Mat'46 ELD2 is available in version 2 from now on. For those who already own Dutch Classics 10 it is advisable to upgrade to version two when you order Dutch Classics 11. Version two of Dutch Classics 10 is available on request for security purposes. Those who own Dutch Classics 10 and do not purchase Dutch Classics 11, upgrading to version two of Dutch Classics 10 is not required. This weekend, the weekend of December 15, the last tests are carried out of both the two part Mat'46 class EMU's and the four part Mat'46 class EMU's. The two part EMU's, generally known by the name 'ELD2' were already released in January 2018, but next to the release of the ELD4, the four part EMU's, a large update of the ELD2 EMU's is also released. This is necessary because ELD2 and ELD4 share a number of resources in order to optimize memory use. Your attention please! This weekend we are busy with planned system maintenance. Because of this, orders that are placed between today 11:00 AM and Monday, May 21st can only be delivered from Monday, May 21st, 20:00 CET. 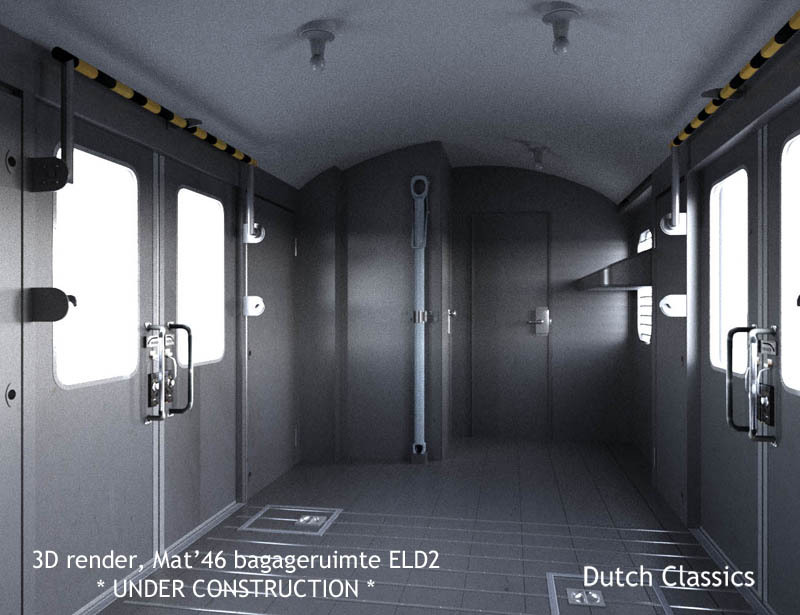 In the next news update we will inform you about the current project of Dutch Classics which is in an advanced stage of completion: Dutch Classics 11, Mat'46 EMU's, ELD4 (four part EMU's). We wish you all a good weekend! Dutch Classics 10 is ready for release! The new add on will be available later today. Finally we can give you the long awaited information about the release of Dutch Classics 10, Materieel 1946. Dutch Classics 10 will be available from January 30, 2018. In the past weekend the last improvements have been made on the 3D train models and on the scripting. These improvements were really the final touch. 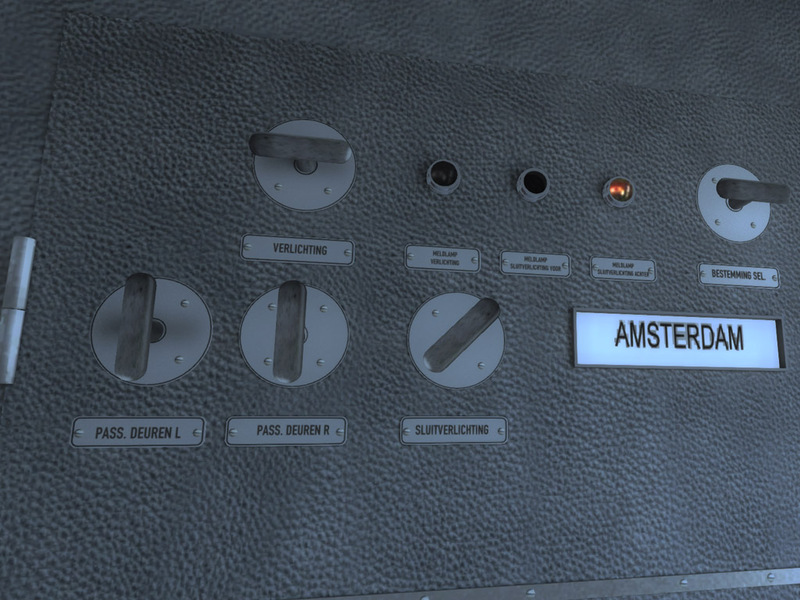 With these improvements the development of Dutch Classics 10 has been completed for now. Those of you who registered for updates per email will receive more information about the upcoming release in the coming week. 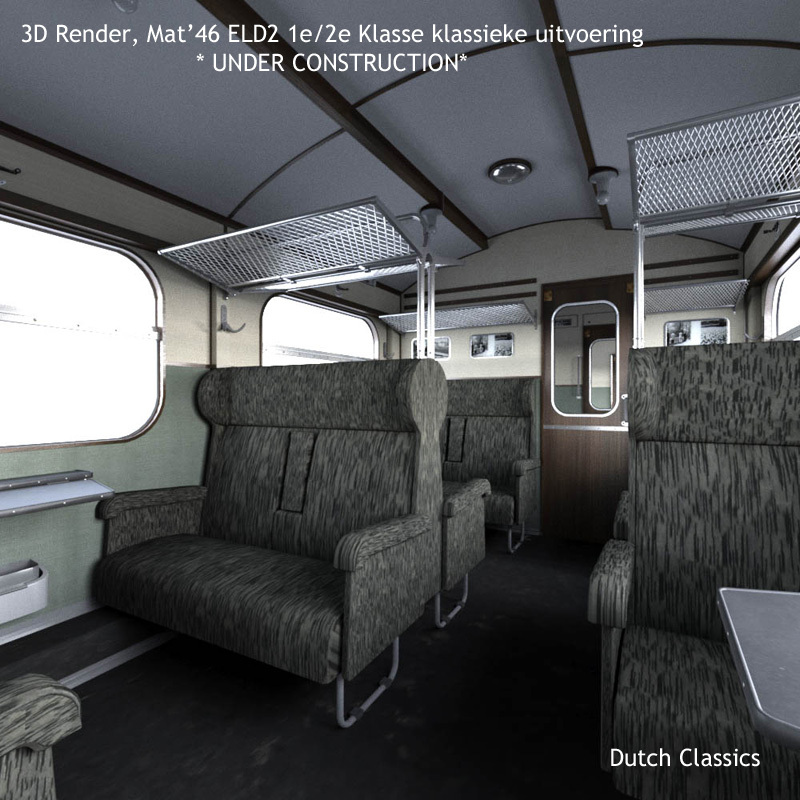 If there should be reason for improvement of the Mat'46 EMU's as a result of driving experiences beore the release, we will of course include improvements if any in the release version of Dutch Classics 10. A further delay of the release is not to be expected however. For the Materieel 1946 EMU's we focus on the sound effects in the coming week. With original sounds from the real world EMU's as a source we will sample as many original sound effects as possible, where they are relevant. The recreation of sound effects is always a very time consuming task, but also an important one, because good sound effects can make the difference between a good virtual model and a great virtual model. But of course everything also depends on good sound effect sources, our sound recordings of a memorial event where Materieel 1946 was present earlier this year were spoilt by sound interruptions from outher sources. Furthermore the scripting of the EMU's is tested thoroughly during the test drives. One issue that we ran into was the fact that we were able to depart without raised pantographs in Quickdrive, which is of course unacceptable. The has fortunately been fixed already. We do not expect that big issues with the scripting will arise during the coming week, but perhaps a new bug or unexpectected 'feature' will surface after all. We optimized the memory use of the EMU's in the simulation, which means that the memory footpring of the trains has been considerably reduced and is lower than the memory use of the Class 1954 EMU's from Dutch Classics 8 now. That is good news, because we can only 'spend' less than four Gigabytes of RAM in the 32 bits version of DTG Train Simulator and that memory needs to be shared between route, other trains and all scenery in a route. Of course we keep the original version of the Materieel 1946 EMU's at hand, if and when a 64 bit version of Train Simulator should be released this can become very useful. When the sound effects are complete, Materieel 1946 willl be ready for release and that means that the EMU's will be released as soon as possible in that case. Traditionally, tghe days before Christmas ar e very busy and this year is no exception to that rule. Still, the finishing touch of the Mat'46 trains is also on the agenda. Important message: due to an event, orders will be processed from 20:00 CET today and tomorrow. We aplogize for the inconvenience. Other news: Our latest Dutch Classics 10 add on is unfortunately not available yet.. 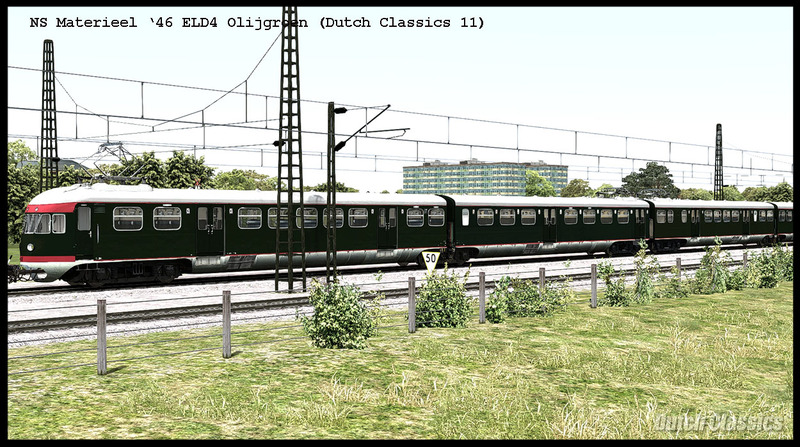 However, we work hard to complete the EMU's that are included in Dutch Classics 10 for a release in the near future. In the past weeks, the so called expert mode has been added to the Mat'46 EMU's from Dutch Classics 10. Both simple mode and expert mode are available in the EMUs now. The functions that are available show similarity with the functions that are included in the Mat'54 EMU's which are part of Dutch Classics 6 and 8. Of course there are some specific characteristics of the Mat'46 EMU's. For example, the scripting offers the option to activate or deactivate every individual pantograph in the EMU's. Every ELD2 EMU carriage has one pantograph, but in an EMU unit, only one pantograph is in active use. The collection of EMU's for Dutch Classics 10 has been made complete, with the yellow modernized edition as a latest addition. For every EMU type, a passenger view is available, which shows the interior in high detail, for both first/second and second/third class compartments. 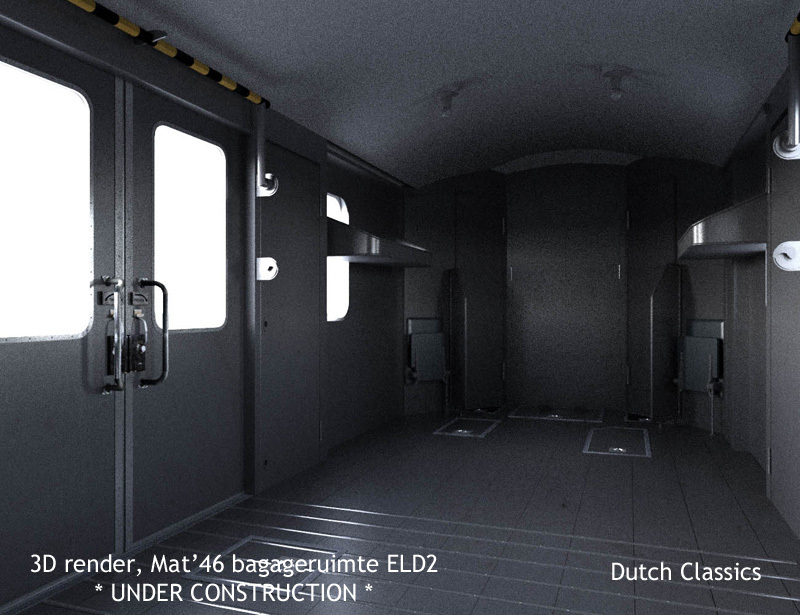 In this newsupdate we bring you information about the development of Dutch Classics 10 - EMU's Mat'46. In the past six months we have done our best to recreate the Mat'46 EMU's for Train Simulator, to be included in this add on pack. The development of a virtual version of rolling stock for Train Simulator in the quality that we want to achieve takes a lot of effort. However, we expect to release the add on pack soon. In the past month we did a lot of work in order to complete the development of the Mat'46 EMU's. At this time we are working on the Mat'46 cab, which has already been partially completed for use as a virtual cabin in Train Simulator. In December 2016 we already created almost all cabin components in the 3D editor, so that we have gained a lot of time, because we only need to prepare the cab components with the correct shaders at this time; also, most parts are rendered for realistic light/shadow effects. Cabin walls, floor, ceiling, instrument panel and a lot of other parts are already included in the TS version of the Mat'46 cabin. The cabin interior shows some distant similarity with the cabin of Mat'54, but has got an older design and of course the nose of the EMU's is completely different from the nose design of the Mat'54 EMU's. Also, the position of the engine driver of the Mat'46 EMU's is considerably lower than the position of the the engine driver in Mat'54. The protective construction in the cabin for the engine driver in the Mat'46 EMU's is not a luxury, but a necessity to protect the driver during a collision. The construction is clearly recognizable on the front left and right of the cabin. The Mat'46 EMU's have driven many kilometers in Train Simulator already. From the liveries of the EMU's, all have already been recreated, except for the yellow livery that some EMU's had in the last decade of the operational service. The EMU's combine well with the Mat'54 and Mat'57 EMU series; the scripting of the train makes combined consists possible. Looking at the release planning, at least a few more weeks are required to get the EMU's ready for release. Our planning aimed at a release around the end of June, but a lot of work still needs to be done to keep this schedule. With the release a large number of consists will be available, not only with the Mat'46 EMU's themselves, but also with the EMU's from Dutch Classics 6 and Dutch Classics 8. The scripting of the functions of the Mat'46 EMU's has finally started. The 3D model of the exterior is not ready yet, but because we take the Mat'46 EMU's out for test drives anyway, a part of the functions, such as the operation of doors and pantographs can already be tested. The functions of the Mat'46 EMU's are generally similar to the functions of the later Mat'54 EMU's which were interchangeable in consists, with some limitations. It has been some time ago already since we last posted a news update on the web site. In the meantime we have made a lot of good progress in the development of the Mat'46 EMU's, but unfortunately the virtual version of the EMU is not ready for release yet, a lot of development work still needs to be done. At the end of March we had the opportunity to drive in the real example of the museum EMU of Mat'46 during an event which was organised because the railway line from Rotterdam to the Hook of Holland is being rebuilt, the trains of the Dutch Railways will be replaced by the Rotterdam metro service. Except for the fact that it was a very enjoyable experience to drive back and forth in the EMU's as a passenger we had the opportunity to take a lot of good pictures of the interior and exterior. At this opportunity we found out that we did good work on the interior, the 3D model of the interior looks is as similar to the real example as we could make it. On the outside 3D model of the EMU's we will make some adjustments to add more details. At this time the second part of the two part EMU of Mat'46 is being built. 80 percent of the details is already there, the rest will follow in the coming days. After this there will still be a lot to do. The EMU's need to be made specific for the different era's that they were in service in and the cabin, scripting, sound effects, animations and other things that are required for the release still need to be done, although most of the 3D model of the cabin is already complete. We will keep you informed in the coming time! Even when we do not post updates here, work on the beautiful historic train models of Dutch Classics continues almost every day. A lot of work has been done since our last update on this site. The Mat'46 EMU's have been completed for a large part and are being made ready for Train Simulator. The EMU's have already succesfully made their first test drives in Train Simulator. It appears now that the EMU's look very beautiful in Train Simulator with their characteristic shape. Unfortunately we cannot show screenshots yet, the 3D model of the EMU's has not been completed yet, so that you might get a wrong impression of the trains at this time. Given the fact that we make good progress in completing the EMU's, we expect that they will be ready for release at the end of April. The Mat'46 EMU's are part of a 'family' of similar Dutch trainsets, both electric and diesel, so that it is clear in which direction our future developments will go in the near future. At this time however we focus on the completion of Mat'46. In the coming time we will work on the completion of the interior of the trains and on the completion of the cabin functions. The development of the historic Dutch Mat'46 EMU series for Train Simulator 2017 is going as planned and with good results until now. Work on the development is continuing step by step almost every day and hundreds of hours have been spent already! The development has started in August of this year, so we have been under way for a few months, with some interruptions because of other activities. The development of virtual rolling stock in the quality that we are aiming at is a time consuming activity. The high level of detail that we create the rolling stock in takes a lot of time, but has got some advantages. For example, the capabilities of computers increase over time, which means that a level of detail that seems to be over the top at this time is a 'normal' and 'expected' level of detail in the near future. It may save us a lot of time for future rolling stock development when we make the 3D models future proof by adding more detail than should be required now. Still, we keep the level of detail on the outside of the EMU's so that Train Simulator will not run out of computer resources (memory) quickly. As many of you know, Train Simulator 2017 is still a 32 bit program, which means that the use of computer RAM is limited to a maximum below 4 Gbyte, so some limitation in memory use, for example with reduction of the rolling stock texture size, is an important point of attention for us. To give an impression of the development process: we started with collecting as much documentation and as much photographic material of the EMU's as possible. Technical drawings are essential as they show the exact dimensions of the parts that the trains consist of. Only after we had all this material available, we started the development of the 3D model of the EMU's. The shape of the EMU's and especially the front of the train is a very critical part, because the 'nose' of the train is very characteristic. Even small differences between the shape of the real world train and the shape of the 3D model can be seen easily. Moreover, because of the round nose of the EMU's, the development of the cabview shows immediately if the dimensions of the train are incorrect. The building blocks of the cabview fit together like a large puzzle and they would be very hard to recreate in the 3D model of the cabview when the dimensions of the nose would be incorrect. Fortunately we succeeded in recreating the real EMU shape very well, so that the creation of the virtual cabin of the EMU's did not show any large issues. What is the status of the development project at this time? The add on will contrain two versions of the EMU's, the two part EMU and the four part EMU. The EMU's will be available in several different liveries, according to the era that they were in service in. The other EMU parts have been shaped in the correct dimensions, but they await further detailing. 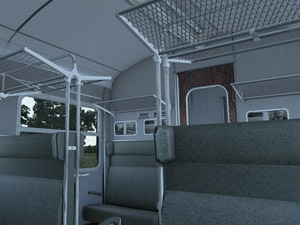 The interior of the two part EMU's has been recreated in high detail and is ready to be included in a passenger view and the external view 3D model. 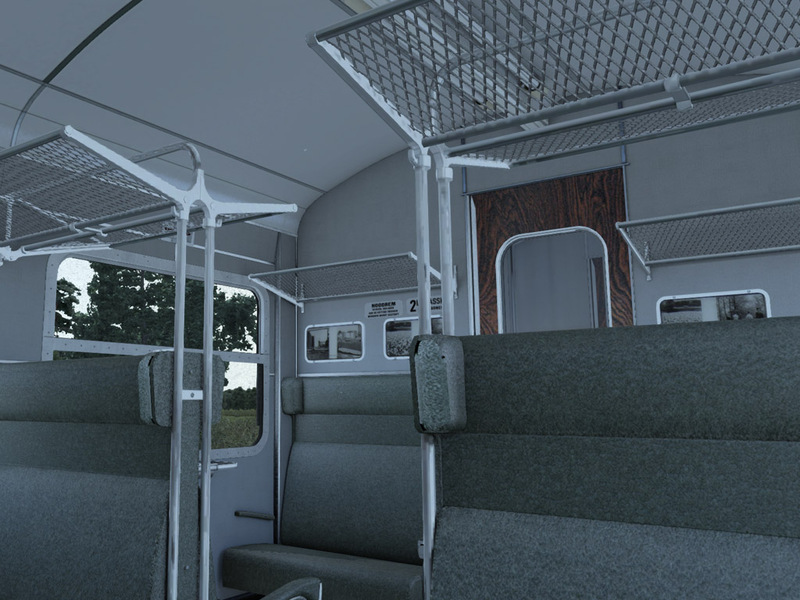 Some work in progress screenshots show the current status of the interior of the EMU's and of the cabview. They show the development version of the EMU's which is rendered in the 3D editor. 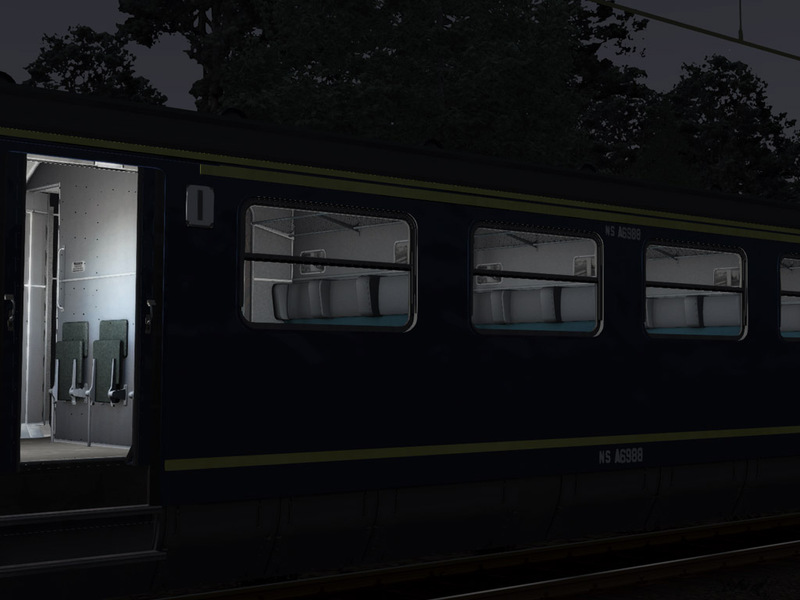 When all parts are available, the interior and cabview will be made ready for export to Train Simulator. At this time the 3D models are train simulation software independent. In fact, we could even export them to the Unreal Engine and do a walkaround of the in virtual reality, which would be very cool, but is not something we will do at this time, because our first priority is to get the 3D models ready for export to train simulator. In the coming days we will complete the 3D model of the cabview and make the cabview ready for export/import to Train Simulator. This means that relevant animations will be added, from regulator to the ashtray in the cabin and that necessary blueprint files for Train Simulator will be created. We expect that the cabview will be ready before Christmas 2016. Compared to the cabview of the Mat'54 EMU's that we released earlier, the position of the virtual engine driver is considerably lower above the tracks than the engine driver of the Mat'54 EMU's, which is something to get used to. To be continued! 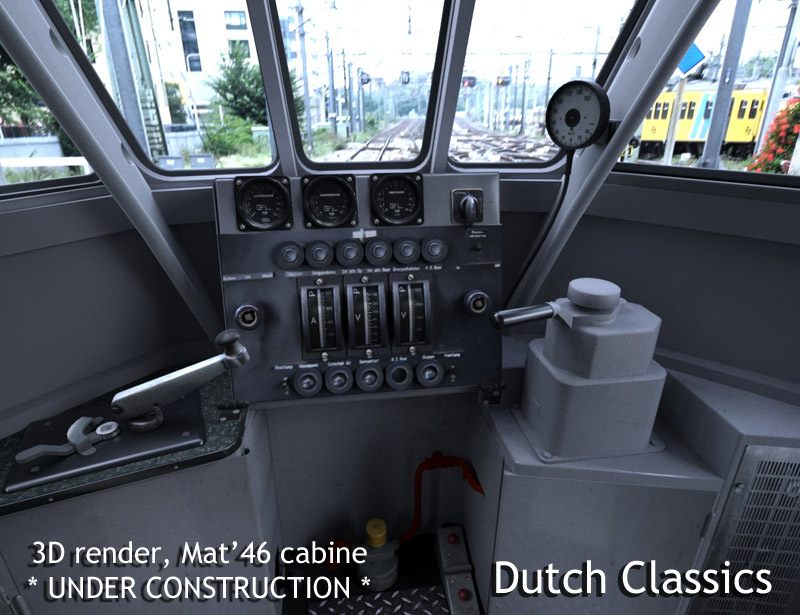 Currently we still have our latest add on, Dutch Classics 10 under development, which contains the EMU class 'Materieel '46'. The '46' refers to the release year. 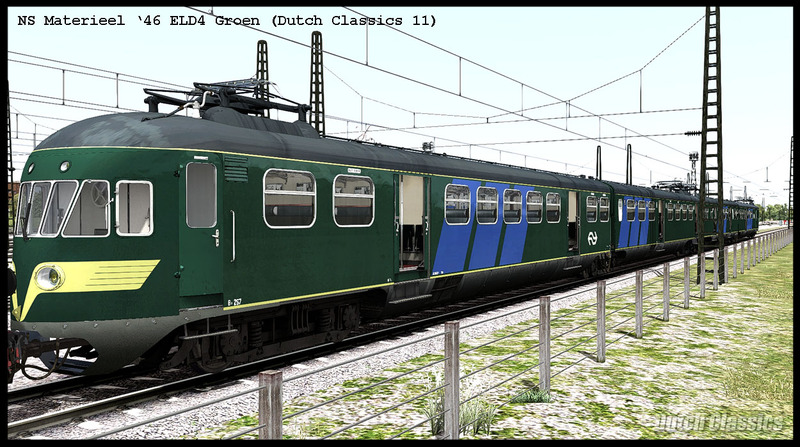 The EMU series of Dutch Classics 10 will contain both the ELD2 (two coach EMU's) and ELD4 (four coach EMU's). The exterior of the EMU's is already very recognizable, all coach types have been created in their basic shape and they await further detailing. At this time we concentrate on the recreation of the EMU interior, which is being rendered with all interior materials, based on the real world example. 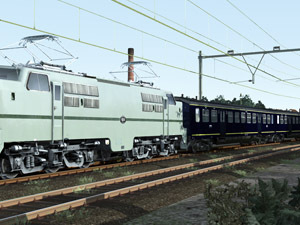 The result is comparable with the quality of the EMU's in Dutch Classics 8, so you will find almost all details of the real EMU's in the virtual trains. However, we do our best to keep the memory footprint of the EMU's as small as possible. As you know, TS 2017 is a 32 bit program, which puts some limitations on the level of detail and the size of the textures used. The development of the EMU's is running at full speed at this time, so we hope that we can show you some screenshots soon! Version two of the 1200 engine class for Dutch Classics 3 has been ready for a few weeks already. However, we decided to improve the installation procedure to make sure that the add on is installed on the correct location in Train Simulator. The installer now contains a better detection of the installation location of Train Simulator. For current owners of Dutch Classics 3 the second version is a recommended update, because the functionality has been improved. It is available on request. For the update of Dutch Classics 6, only the instruction manual needs to be updated. In the mean time, work on the new Dutch Classics add on has started. For Dutch Classics 10 we decided to go back in time a little further and recreate the EMU class that has been common in the second half of the twentieth century: 'Materieel 1946', which was an EMU class with similarities to the earlier Materieel 1936 and Materieel 1940 and features a beautiful streamlined shape that was very modern at the time they were introduced. The EMU class '46 has been in service in The Netherlands until the start of the 1980's and can still be seen in the Dutch national railway museum. It will be a very nice and useful add on because the Mat'46 EMU's could often be seen in consists with the Mat'54 EMU class from Dutch Classics 6 and 8. A small issue with the loco brake of the 1200 engines has been noticed during the tests. This is solved first, before version 2 of the 1200 is released. Version 2 of the 1200 engines in Dutch Classics 3 is finally ready. In the past days the instruction manuals has been upgraded to reflect the latest version aand the engines have been thoroughly tested. In the course of this weekend it comes availoable. This new version is much more than just an update, the entire add on has been revised. The new version has got a new file structure. All engines, cabs, scripts and almost all textures have been reexported. Also, one engine version and one engine sub version have been added to the collection, animations have been added, the bogies have been re-rendered. What remains the same to support existing scenario´s is the location of the engines' blueprint files. We expect that the new version comes available later this weekend. The updated version of the 1200 engine is almost ready. In the past days the door animations have been improved. Among others, the door knobs are animated now. We have some delay compared to our original release planning, but the work on the updated 1200 engine should be completed soon. From today, Dutch Classics 9 is available in the shop. The instruction manual for Dutch Classics 9 is still in Dutch language at this time, but we are working on the translation at the moment. The international instruction manual will be ready within a few days. The coach series Plan E of Dutch Classics 9 is finally ready for release. We are preparing the release of the add on at the moment; the coaches will appear in the shop on one of the coming days. 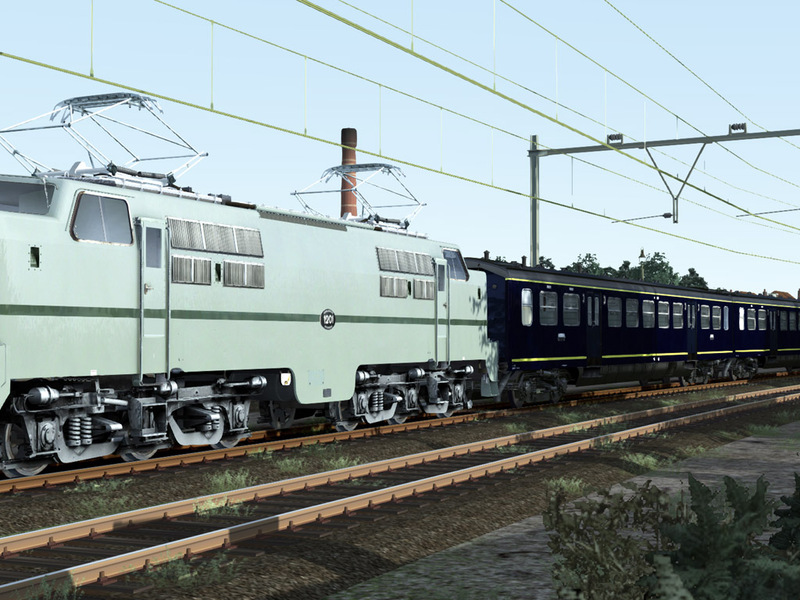 Within a few days we will see a new release again: Dutch Classics 9, passenger coaches series 'Plan E' is almost ready! From this place we would like to thank everyone who registered for news and updates; we will inform those who registered when the release will be there. Currently we are configuring the last necessary things for the release of the Plan E class coach series. The add on took quite some time to develop, but of course there is much more to the creation of a full add on for Train Simulator than just sitting in front of the 3d editor and creating a set of passenger coaches, that is, if you take development seriously. We collected a lot of background information, we needed to find some antique books in second hand bookstores, we searched the internet for all relevant documentation and so on and so on. We also collected a lot of old photographs from a Dutch archive to see that the coaches looked like when they were delivered to the Dutch railways. The rendering of the interior of the Plan E coaches took quite some time, but this pays off because we were able to recreate two passenger views where you can walk through the entire length of the coach. 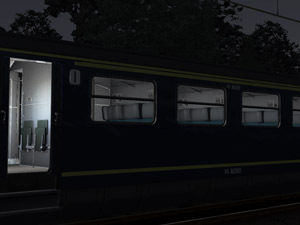 Also we did our best to add extra value to the coaches to make them more than just a set of static rolling stock to watch while you are driving your virtual train from A to B. We value interactivity in train simulation because we think that this makes this hobby much more interesting that just treating train simulation as a kind of model train hobby. Finally, we did our best to add as much detail to the Plan E coaches as is practically possible within the limits of train simulator. Displaying polygons of the coaches on the computer screen takes GPU capacity, large textures eat away a lot of valuable memory. Therefore we did our best to limit polys and textures as much as possible while still showing a lot of detail; the level of detail on the coaches is comparable to the detail level on the previous add ons, such as the Mat'54 and Mat'57 EMU series. From Dutch Classics we can inform you about a number of interesting things. December is always a busy month, and with the development of updates and new add ons it only gets more busy, but also more exciting. It is especially exciting to bring new rolling stock on the track that we never saw in Railworks Train Simulator before in the level of detail that we created the rolling stock in. The first series of the Dutch Class E coaches, which were in service in long distance domestic express trains and incidentally in international trains as far as Koblenz, Germany, is getting its shape. The characteristic shape of the coaches is getting very recognizable for those who know this type of rolling stock. The first series contains the second/third class B/C coaches in a number of editions. We already saw that they combine very well with the Plan D coach series of Dutch Classics 7 and Megapack 1, so we are very enthusiastic about this extension of the Dutch rolling stock. The bogies have already been shaped in high detail, just like a large part of the lower part of the coaches and a large part of the rest of the exterior. In the Class E coach series you will both find high detailed editions and editions that are low on poly's, so that you can choose the detail level that you need. Improvement of the behaviour of AI trains. At departure of the engine, two pantographs are up, as soon as the engine exceeds the speed of 30 km/h, the front pantograph will be lowered, just like in the real example. The engine simulation in expert mode has been adjusted. Just like the Mat'54 EMU's of Dutch Classics 6 and 8, the 1200 engine contains a saving reservoir of compressed air that can be very handy when the braking system does not have sufficient air pressure. When there is insufficient air pressure in both the saving reservoir and in the main reservoir, you will need to raise a pantograph manually (with a lot of keyboard key presses) in order to be able to have high voltage for the compressor the build up air pressure. In order to make the operation of the engines in expert mode easier, keyboard operation of a number of important functions has been added. The key combinations follow the scheme that has been created for the other engines and for the operation of the Mat'54 EMU's. This prevents confusion for virtual train drivers that switch cabs from the 1200 to the other engines or vice versa. The functionality in simple mode has been adjusted too, so that the keyboard operation matches the key combinations in expert mode where it is applicable. A number of nice to have functions has been added: a conductor whistle that can be used to announce the departure of the train, for the coaches of the other Dutch Classics add ons that support this (among others the Class E coaches) you can operate the interior lights and the passenger doors from the engine by using key combinations. The update considerably extends the functionality of the Class 1200 engines. The exterior of the engine has not been adjusted yet in this update, but we keep all options open to add at least two more color schemes. The update is currently extensively tested; release will follow as soon as no issues are seen anymore. In the past month we spent a lot of time to update the software that we use for the development of the add ons for Train Simulator. For this reason we haven't been able to publish screenshots of our development activities. From now on we continue our mission to create high quality add ons for Train Simulator at full speed again! The release of Dutch Classics 8 is already two weeks behind us. The release was successful, perhaps also because of the rigorous testing of the add on, only a few minor issues have been reported which will be covered in a future small update. 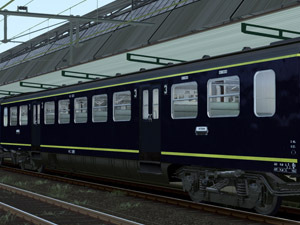 One of the reported issues has got to do with the available rolling stock in the scenarios that are included in Dutch Classics 8 which is not present in all editions of Train Simulator. After the release of Dutch Classics 8, we continue with the next projects on the agenda at full speed. At this time we concentrate on the update for Dutch Classics 6. 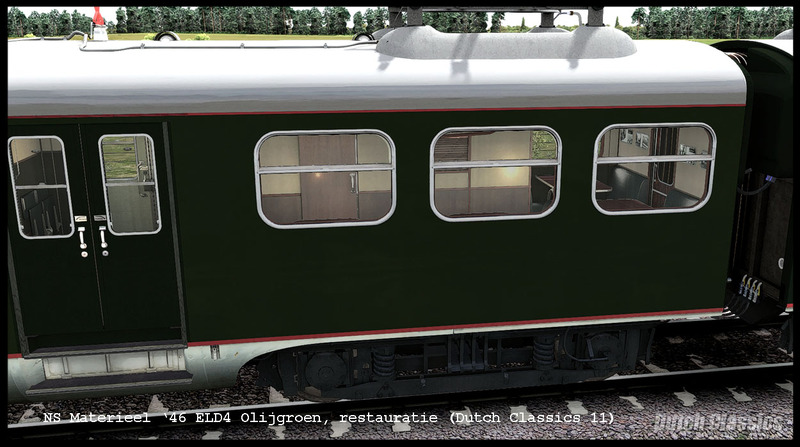 The update has got to do with the fact that the functionality and behavior of the rolling stock in Dutch Classics 6 and Dutch Classics 8 should be identical, so that mixed consists with rolling stock of both add-ons can be used, just like in the real world. This means that a number of components of Dutch Classics 6 require an update. First of all, the animation of the windshield wipers of the EMU's of Dutch Classics 6 needs to be changed. In the EMU's in Dutch Classics 8 the three windshield wipers can be operated independent of each other, which was not yet the case in the rolling stock in Dutch Classics 6. Under the hood of the EMU's of Dutch Classics 6, a lot more changes are made, for which the scripting of the trains is changed. A cosmetic change of the front of the EMU's of Dutch Classics 6 makes the appearance of the EMU's similar to those in Dutch Classics 8. The grey plating below the nose of the trains is changed to match the appearance of the EMU's in Dutch Classics 8. Animations, the blueprints in which all functions are defined and the scripting have been updated for a great part already. Half of the EMU series of Dutch Classics 6 is sent to the depot in order to make the cosmetic changes that the other half of the rolling stock collection already has. The other plans for future updates and releases have not changed. This means that a rigorous update of the functionality of the Dutch Classics engines 1100, 1200 and 1300 are still on the list. the development of a new add on with a legendary Dutch rolling stock series has already started. We have chosen to recreate the Dutch Plan E rolling stock series. This series fits very well into the existing collection of rolling stock that Dutch Classics has created and moreover, the size of this add on is more limited than the size of the Dutch Classics 8 add on. The expected development time will be much shorter than the extremely long time we required to develop Dutch Classics 8. 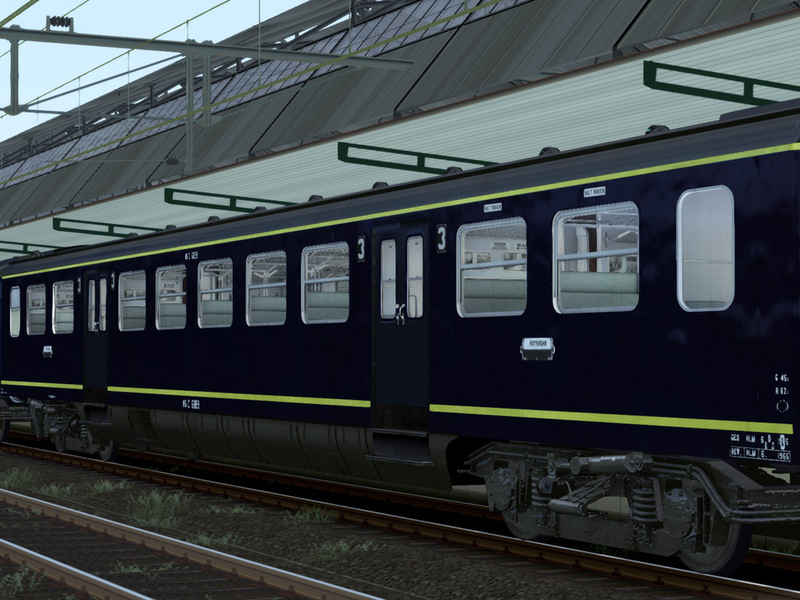 Still it will be very exciting to release yet another historic Dutch rolling stock series for Train Simulator. the new web site is finally online! Dutch Classics 8 is now also available in the shop. The latest addition to the Mat'54 and Mat'57 EMU classes for Dutch Classics 8 is the parking brake - a very convenient feature that prevents the train from rolling when parked on a sloping track. Dutch Classics 6 is being patched in order to make the functionality of Dutch Classics 6 similar to the functionality in Dutch Classics 8. Amongst others, the nose of the Mat'54 EMU's from Dutch Classics 6 is modified on details. In the meantime, the scripting for Dutch Classics 8 continues at full speed. It has taken a while, but the Mat'54 and Mat'56 train operate as designed on almost all points. Latest added feature is the independent operation of the three windshield wipers in the cabin. The new web site has been made ready for launch. We also carried out a test with the Dutch Classics engines in combination with much more advanced scripting, derived from the scripts from Dutch Classics 8. The features work fine and improve the usability of the engines because the distinction between simple mode engines and expert mode will be removed. Every engine can be switched from simple mode to expert mode after the coming update. The tests of the trains for Dutch Classics 8 continue for a while, with the objective to guarantee an error free release. the combination of the Mat'54 and Mat'57 EMU's in one consist bring interesting challenges. Example: the power system in the Mat'57 EMU's supports dual voltage operation. The Belgian 3000 Volt power system is not supported by the Dutch Mat'54 EMU's. When the Mat'54 and Mat'57 EMU's are coupled, the 3000 Volt power system is not supposed to supply the Mat'54 EMU's with power from the overhead wires. This is one of the interesting aspects when driving combined consists of the domestic Mat'54 and the international Mat'57 EMU's. The 3D models and scripting of the Mat'54 and Mat'57 EMU's are ready. The coming time will be used to carry out testing and optimization to make sure that the system load is minimized and performance is maximized, given the high detail level of the trains. Where possible, the trains will be optimized. Also, some extra functions are added. The preparations for the development of new add ons and for the updates of the existing add ons have started, so that we can continue development at full speed after the release of Dutch Classics 8. The objective is to minimize development time for future add ons. The finishing touch is given to the 3D models of the Mat'54 and Mat'57 EMU's. The scripting has been completed and the Benelux EMU's and 'Hondekop' EMU's drive together fine in mixed consists. Our new web site is under construction; it will replace the current web site on short term. most important reason for this is the desire for much more flexibility in the content and also the desire to support a multi language web site, which is not well possible in the current configuration. At this time all content is migrated step by step from the old to the new web site; as soon as the new site is ready it will be available here. There will be no down time during the switch and the old web site will be available for the time being after release of the new site. The operation of the pantograph is only possible when air pressure is available for operation. When no air pressure is available in the air system, it is possible to raise the pantograph above the active cabin by hand. For this, a new keyboard shortcut has been defined. Also, a 'saving reservoir' is available that contains air which can be used to fill the main air reservoir when the main air reservoir does not have sufficient air pressure. At the start of a scenario, the air pressure is defined with a random value. This means that sometimes there is sufficient air pressure available at the start of scenario and sometimes there isn't. Only after raising of at least one pantograph you can start the compressor to fill the main reservoir with the required air. All this happens in expert mode. The compressor which amongst other supplies the braking system with air only works when high voltage is available. The operation of headlights and tail lights is now possible without switching on the operating current. It is expected that we need a few more days to finish the scripting. When the scripting is ready, all content for Dutch Classics 8 is also ready. Before the release of Dutch Classics 8 however we carry out thorough tests. It appears that the release of Dutch Classics 8 is coming closer. The development and testing of the scripts for Dutch Classics 8 is continuing and goes as planned. We except to finish the development of the scripts this week. The functionality of the scripts for Dutch Classics 6 is made so that they are compatible with each other. Also the operation of the Mat'54 and Mat'57 EMU's is made so that they can be used in mixed consists. Of course we take into consideration the fact that the Mat'57 EMU's are dual voltage EMU's, compatible with the Dutch and Belgian overhead wire system. Both the Dutch and the Belgian pantographs on the MAt'57 EMU's are functional. 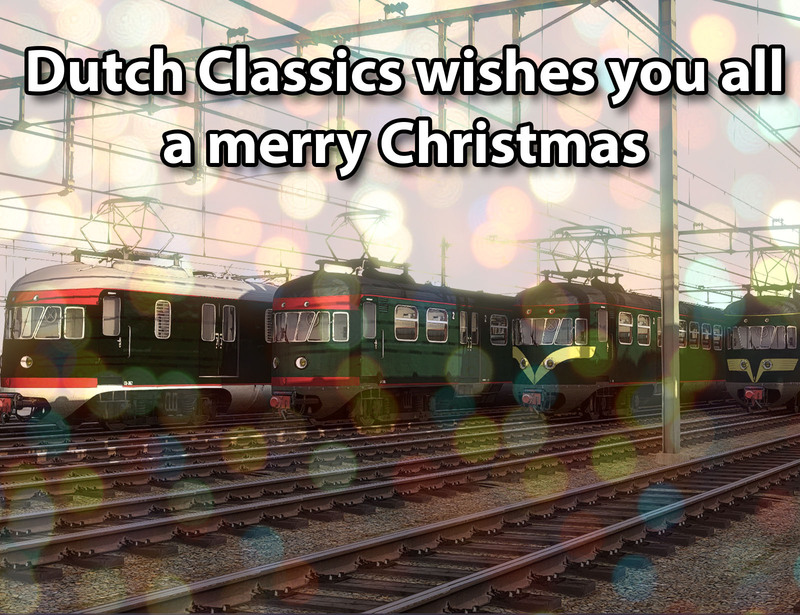 We will update Dutch Classics 6 after the release of Dutch Classics 8 so that the functionality is similar between both EMU series. A coach of a Mat'54 EMU which has no pantograph will behave like a coach without pantograph. When the coach is part of a powered consist, the power from the overhead wires is not available anymore in the coach after decoupling, at least not in the coach without pantograph. The 3D models of the Benelux EMU's are ready! Last step in the development of Dutch Classics 8 is the development of the scripting for the Mat'57 EMU's. The roof of the Mat'57 EMU's has been shaped according to the real world example. The Belgian pantograph has got the authentic shape and differs from the Dutch pantograph. Next step: shaping the further details on the Mat'57 EMU's.